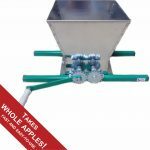 Apples must be pulped before going into the press. You can do this with a wooden pole in a tub, if you have the stamina! 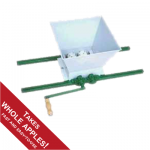 However, more convenient and faster for larger quantities, are our wide range of apple crushers, mills or ‘scratters’. So which crusher shall I choose then? 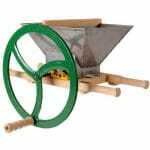 The cheapest option is our apple grater/scratter. 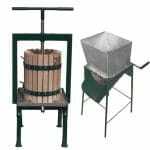 Unlike nearly all other mills on the market, it can cope with whole apples. 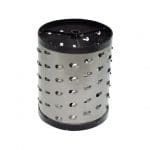 It is really like a rotating grater. 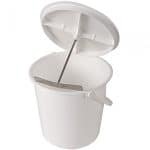 Simply place apples of any size in the hopper, place a food-safe plastic tub or bucket in front of the shoot and turn the handle. 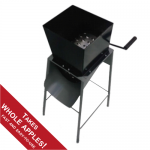 This efficient little machine can shred about a bucketful (5kg) of apples in about three and a half minutes. After use wash thoroughly. The non-stainless steel version needs further care. 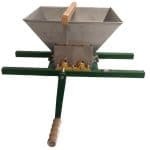 Our Czech manual apple mill does an equally good job, but can be put on top of a cross-beam press, or suspended (eg. between two chairs) above a bucket or tub. 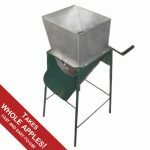 You then put the apples in the hopper and turn the handle. 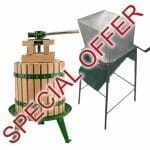 It can cope with large whole apples, and is equally as fast as the apple grater/scratter (one bucketful or 5kg in 3 and a half minutes.) Again wash thoroughly after use. 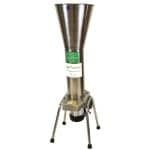 The drill mills can be used in combination with any normal electric drill. 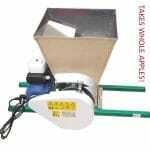 They are a budget option and are suitable for hobby production on a larger, faster scale. Our largest electric mill simply runs from an electrical socket. 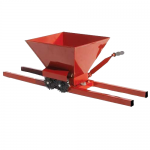 This machine is simple to operate and suitable for commercial use.